The All Party Parliamentary Group on Women's Health holds regular events at Westminster to inform MPs, Peers and wider stakeholders on women's health related issues. If you would like to put your name forward for invitations to meetings or would like a copy of minutes, attendees and decisions make at meetings, please contact the secretariat at appgwh@mailpbconsulting.com. Please see below more information on upcoming as well as past events. The Women’s Health All-Party Parliamentary Group, chaired by Paula Sherriff MP, hosted its second annual Women’s Health Conference to empower women to make informed choices about medical treatment and to raise the profile of women’s health and surrounding issues within parliament and amongst the general public. The event brought together MPs, patient groups, industry, clinical experts and many others for three panel discussions on prominent topics surrounding women’s health. This year’s focus was on (i) women’s health inequalities, (ii) transforming menstrual health, and (iii) the role of awareness and education. The conference hosted several high profile speakers including Jackie Doyle-Price MP (the Minister responsible for women’s health) and Jon Ashworth MP (Shadow Secretary of State for Health and Social Care). On the 23rd of October the Menstrual Health Coalition was launched. The aim of the launch was to gather a group of experts to discuss the expectations, future activities and objectives of the coalition. On the 16th of July, from 14:30-16:00, the WHAPPG hosted two key events in Committee Room 18: the Group's AGM and a Heart and Stroke Oral Evidence Roundtable. The All Party Parliamentary Group on Women's Health held it's Annual General Meeting, and there was a formal election of officers and the approval of the Group's income and expenditure statement for publication was agreed. Attendees included Paula Sherriff MP, Liz McInnes MP, Paul Scully MP, Baroness Howe of Idlicote and Baroness Hodgson of Abinger. The Group hosted the first ever Women’s Health Parliamentary Conference to mark the month of International Women’s Day on 22nd March 2018. 'Rationing of women’s health services' with Paula Sherriff MP, Councillor Jonathan McShane, Dr Priya Agrawal, Dr Anatole Menon-Johansson, and Dr Christian Jessen. 'Is this normal?' with Liz McInnes MP, Dr Anne Connolly, Manjit Gill, Athena Lamnisos, Dr Ellie Cannon, and Chella Quint. 'How are women treated in the NHS?' with Paula Sherriff MP, Dr Sarah Clarke, Dr Ghada Mikhail, Professor Erika Denton, and Katie Piper. There was also a showcase by patient groups Breast Cancer Care, Endometriosis UK, Jo's Cervical Cancer Trust, Ovarian Cancer Action, Pelvic Pain Support Network, Verity and Period Positive. 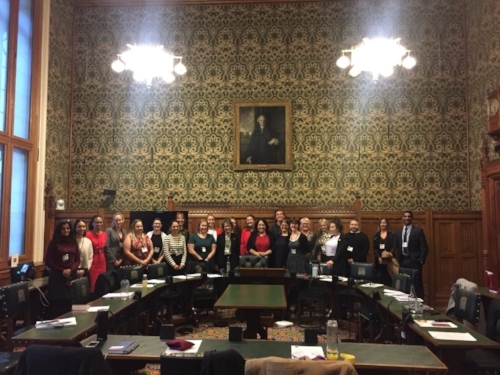 The All-Party Parliamentary Group on Women's Health hosted a roundtable discussion with key stakeholders to discuss how to take forward the recommendations outlined in the Informed Choice report. Dr Matthew Jolly, Clinical Director for Maternity Review and Women's Health at NHS England spoke as did Dr Anne Mackie, Director of Screening at Public Health England. The meeting took place on Tuesday 17th October 2017, 3pm until 4pm in Portcullis House, Room T.
Following the 2017 General Election, the the All Party Parliamentary Group on Women's Health held it's Annual General Meeting in Room Q of Portcullis House at 4:00pm. There was a formal election of officers and the approval of the Group's income and expenditure statement for publication was agreed. Attendees included Paula Sherriff MP, Paul Scully MP, Colleen Fletcher MP, Liz McInnes MP and Chris Davies MP. The Group launched it's inaugural report on Informed Choice on Monday 27th March, 4:00-6:00pm in the Attlee Suite of Portcullis House. The report launch saw patient representatives and parliamentarians, as well as representatives from the Royal College of Nursing and the Royal College of General Practitioners give speeches. There was also a Q&A session. The Group held an oral evidence session, 3:00-5:00pm in the Macmillan Room of Portcullis House, to gather evidence for an inquiry it launched into whether women are given an informed choice about the treatment options available for particular conditions. Endometriosis and fibroids where the conditions the group chose to shine a particular spotlight on. During the session, patient speakers, parliamentarians and clinicians gave evidence and there were three Q&A sessions. The Group held a meeting on Wednesday 19th October, 2016, 3:00-4:30pm in Room A, 1 Parliament Street which focused on the topic of screening, with a particular focus on breast and cervical cancer screening. The group heard from experts about current practice as well as the barriers to and issues surrounding uptake of free screening services in order to understand what key recommendations the group can take forwards. The launch event of the All Party Parliamentary Group on Women's Health took place on 8th June, 2016 from 2:00-3:00pm in Macmillan Room, Portcullis House. Speakers included Angela Rippon, Katie Piper and Caroline Criado Perez. The inaugural meeting and AGM of the All Party Parliamentary Group on Women's Health was held on 27th April, 2016. There was a formal election of officers and the approval of the Group's income and expenditure statement for publication was agreed.